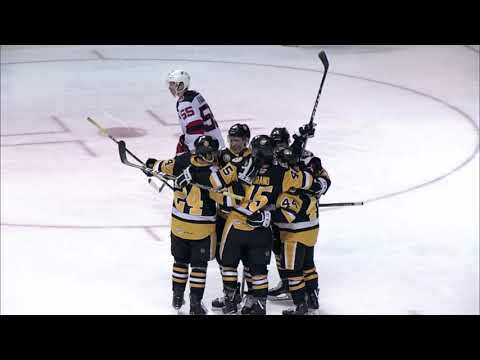 The Wilkes-Barre/Scranton Penguins posted a 5-3 win over the Binghamton Senators on Friday night at the Wachovia Arena at Casey Plaza. The two teams will meet in a preseason rematch Saturday night in Binghamton. Joe Jensen and Connor James each recorded first-period goals, assisting on each other’s tallies at 5:39 and 15:36. Binghamton got on the board 32 seconds into the second period with a Matt Kinch tally, but Alex Goligoski answered for the Pens two minutes later, blasting home his first of the preseason from the left boards to make it 3-1. Danny Bois once again pulled the Senators within one goal, beating Ty Conklin for the power-play goal with 3:01 left in the middle frame. Joe Rullier, in Wilkes-Barre on a tryout basis, took a step toward winning a roster spot when he potted what proved to be the game-winning goal at 4:27 of the third. Tyler Kennedy added an insurance goal for the Penguins, and Tyler Donati closed out the scoring for Binghamton. Conklin made 27 saves to pick up the win in his first game with the Penguins, while Brian Elliot made 33 stops in the loss. The Springfield Falcons scored three third-period goals and rallied to beat the Worcester Sharks, 4-2, on Friday night at the MassMutual Center. With his team trailing 2-1 entering the third period, Falcons defenseman Sebastien Bisaillon tied the score at the 9:21 mark on the power play. Justin Chwedoruk gave the Birds a 3-2 advantage at 14:34, picking up his own rebound on a scrum at the top of the crease. And rookie Colin McDonald provided the Falcons with an insurance goal at 15:27. Mike Iggulden and Brad Staubitz scored for the Sharks. Fredrik Johansson added a shorthanded goal for the Falcons. Springfield goaltender Cam Ellsworth stopped 10 of 12 shots he faced in 34 minutes of action, while Robert Gherson was perfect in relief, stopping all 10 shots he faced. Trevor Smith and Keith Johnson scored third-period goals and Maxime Ouellet and Michael Mole combined for the shutout as Bridgeport defeated Providence, 2-0, in Shelton, Conn., on Friday night. Smith snapped a scoreless tie 5:01 into the final frame, with Johnson and Dustin Kohn assisting. Johnson then provided an insurance goal at 12:55 with a power-play goal, assisted by Jamie Fraser. Jordan Sigalet made 23 saves for the Bruins. The Hamilton Bulldogs dropped a 3-2 decision to the Rochester Americans on Friday night at the ESL Sports Centre in Rochester. The Americans opened the scoring at 7:34 of the first period when Tanner Glass batted his own rebound out of the air and past Bulldogs starting netminder Yann Danis. The goal came just after Hamilton had killed off a two-minute minor penalty. At 13:52 of the second, Duncan Milroy tipped home a shot from the point by Marvin Degon to even the score for the Bulldogs at 1-1. Sergei Kostitsyn also earned an assist on Milroy’s power-play goal. Cedrick Desjardins replaced Danis between the pipes for Hamilton at the start of the third period. Danis turned aside 24 of 25 shots in two full periods of action. The teams exchanged goals early in the final frame. The ‘Dogs took a 2-1 lead just 1:58 into the period when Corey Locke set up Thomas Beauregard for his first goal of the pre-season. Then at 4:53, Kenndal McArdle scored for the Amerks to level the score at 2-2. Rochester went up 3-2 at 11:04 of the third period courtesy of an Adam Taylor goal. The unassisted goal proved to be the game-winner as the Americans held off the Bulldogs for a one-goal win. In relief of Danis, Desjardins made seven saves on nine shots in the third period for the ‘Dogs while Adam Dennis went the distance for the Amerks stopping 16 of the 18 shots he faced. The Albany River Rats opened their 2007 preseason campaign with a resounding 3-0 shutout over the Syracuse Crunch Friday night at Houston Field House in Troy, N.Y. Neither team could crack the armor of either starting goaltender Kevin Nastiuk (Albany) or Dan LaCosta (Syracuse) in the opening period. The River Rats got down to business in the second period: 20 seconds after Yannick Tifu was called for holding, rookie defenseman Brett Peterson knocked in a loose puck, assisted by Noah Babin and Pat Dwyer at 3:05. Newcomer Jamie Johnson doubled the River Rats lead as he banged the puck into an open net after a post-to-post feed from Jerome Samson at 13:19. Samson then skated down the right wing and beat LaCosta to the near post with a wrist shot 16 seconds later. Nastiuk (19 saves) and Peters (9 saves) combined for the shutout for Albany; LaCosta made 30 saves on 33 shots for the Crunch. The Houston Aeros defeated the San Antonio Rampage 2-0 in the preseason debut for both teams in Laredo, Texas. Houston’s Tyler Hirsch scored at 15:18 in the second period to break the scoreless tie, and the Aeros doubled their lead when defenseman Paul Albers wristed in a shot from the top of the right circle at 13:15 of the third. San Antonio’s Josh Tordjman was stellar through the first half of the game making all 12 saves before giving way to David McKee, who made 26 saves. Barry Brust stopped 18 shots for the shutout. Lake Erie scored six unanswered goals over the final half of the game to double up Chicago, 6-3, in Hoffman Estates, Ill.
Tomas Pospisil scored twice as the Wolves opened up a 3-0 lead, but the Monsters responded with three goals late in the second period and three more in the third. Mark McCutcheon had a goal and two assists for Lake Erie, David Jones added a goal and an assist and Ken Roche and Brandon Straub had two assists each. Ian Keserich was perfect in net for the Monsters, making 19 saves in relief of Andrew Penner (12 saves). With a sellout crowd split between Moose fans and loyal Ontarians, Manitoba dropped a 5-3 decision to Toronto in Fort Frances, Ont., on Friday. The Marlies led 2-1 after the first period on power-play goals from Darryl Boyce and Brent Aubin. Jimmy Sharrow scored on a 5-on-3 in the opening frame for the Moose. Tyler Doig and John Mitchell upped Toronto’s lead to 4-1 before Sharrow netted his second goal of the night to make it 4-2 after two. Marc-Andre Bernier pulled Manitoba to within a goal, but Boyce’s empty-netter clinched the victory for Toronto. Todd Ford finished with 32 saves in the win. The teams play again Saturday in Dryden, Ont. Evan Brophey and Jake Dowell each scored twice as the Rockford IceHogs downed the Peoria Rivermen by a 4-2 count in AHL preseason action Friday night in Peoria. Each team scored a pair of power-play goals in the opening frame. Peoria jumped out to a 2-0 lead on goals by Jarrod Skalde and Jean-Guy Trudel 2:13 apart, but the IceHogs took control of the game offensively from there. Dowell and Brophey tallied power-play goals 19 seconds apart to tie the score. Brophey then broke the deadlock in the second period, and Dowell capped his two-goal night in the third. Juuso Riksman played the entire game in net for Peoria, surrendering four goals on 20 shots. Mike Brodeur earned the win for Rockford with 29 saves on 31 shots.